Now You See Me is a 2013 American heist thriller film directed by Louis Leterrier and written by Ed Solomon, Boaz Yakin, and Edward Ricourt. The film features an ensemble cast of Jesse Eisenberg, Mark Ruffalo, Woody Harrelson, Isla Fisher, Dave Franco, Mélanie Laurent, Michael Caine, and Morgan Freeman. The plot follows an FBI agent and an Interpol detective who track a team of illusionists who pull off bank heists during their performances and reward their audiences with the money, attempting to bring them to justice. This is the first installment of a series. The film premiered in New York City on May 21, 2013 before its official release in the United States on May 31, 2013 by Summit Entertainment. The film received mixed reviews from critics but became a box office success, grossing $351.7 million worldwide against a budget of $75 million. The film won the Favorite Thriller Movie at the People's Choice Awards in 2014 and also received nominations for the Empire Award for Best Thriller and the Saturn Award for Best Thriller Film and Best Music. A sequel was released on June 10, 2016. Four stage magicians, J. Daniel "Danny" Atlas (Jesse Eisenberg), Merritt McKinney (Woody Harrelson), Henley Reeves (Isla Fisher), and Jack Wilder (Dave Franco), are each given a tarot card that leads them to the same empty New York City apartment where they find information from an unknown benefactor. A year later, the four have their first major performance as the Four Horsemen in an elaborate Las Vegas show funded by insurance magnate Arthur Tressler (Michael Caine). Their final trick appears to transport one of the audience members to the vault of his bank, the Crédit Républicain in Paris, where stacks of new euro bills are stored. At the magicians' command, the fans in the vault activate, drawing the bills into the vents and then showering the Las Vegas crowd with them. The euros are shown to be real, and the vault in Paris is found to be empty of its recent shipment of euros. FBI agent Dylan Rhodes (Mark Ruffalo), and Interpol agent Alma Dray (Mélanie Laurent), are then partnered to investigate the Horsemen. The two question the magicians but have no evidence to hold them. Dylan and Alma turn to Thaddeus Bradley (Morgan Freeman), a former magician and now a popular video host who makes millions of dollars exposing the tricks behind magic acts. Thaddeus demonstrates how the Horsemen used a mock vault under the Las Vegas stage, and explains that the group must have stolen the money in Paris before it arrived at the bank, and replaced it with flash paper which ignited but left no residue as evidence. Dylan, Alma, and Thaddeus follow the Horsemen to their next show in New Orleans. There their final trick appears to transfer over 140 million dollars from Tressler's private accounts to those in the audience, made up of people that were denied insurance claims by Tressler's company in the wake of Hurricane Katrina. Dylan and Alma attempt to apprehend the four, but the magicians elude arrest. Tressler hires Thaddeus to expose the Horsemen in revenge for the loss of his money. Alma investigates the Horsemen and determines they are connected to a group called the Eye, a small group of magicians that claim to have access to real magic and only accept the best of the best magicians, who have to be invited and pass tests. She finds out that one of the Eye's members, Lionel Shrike, had previously been exposed by Thaddeus, but died in a locked-safe escape trick he was performing in an attempt to regain his standing. Alma suspects a fifth person is aiding the Horsemen. Alma's research leads the FBI to a New York City apartment. When they raid it, three of the Horsemen escape while Jack recovers numerous documents and then leads the authorities on a high-speed car chase. Jack loses control of his car, causing it to flip and catch fire. Dylan is unable to save Jack, but manages to recover the papers, pointing to the Horsemen's next planned crime, stealing millions of dollars in cash out of a large safe of the Elkhorn company. By the time Dylan, Alma, and Thaddeus find the safe it had just been stolen and loaded into a truck. They quickly apprehend the truck, arrange for it to be delivered to its arranged destination, and Dylan hides inside. But when it arrives, and is opened by Bradley and his assistant, it contains nothing but balloon animals. The Horsemen broadcast that they will perform their final show that night at 5 Pointz, inviting the public to attend. The FBI and police converge on the scene and amid the chaos search for the Horsemen. The remaining Horsemen appear to the crowd, giving their fans a farewell and a message about an ulterior purpose, and then run to jump off a roof; Dylan attempts to shoot them but Alma pushes his arm so he misses. The three Horseman jump, turning into a shower of money over the crowd. The money is counterfeit, but the audience's race to collect it prevents the authorities from tracking the real Horsemen. After the show, Thaddeus walks to his car, only to find it full of the money stolen from the Elkhorn safe. Assumed to be the fifth Horseman, he is arrested. Dylan speaks to Thaddeus in jail, where Thaddeus slowly comes to realize that Alma's theory was correct, and Dylan was the fifth Horseman. Dylan quietly walks away, leaving Thaddeus shouting "Why?". Elsewhere, the Horsemen (including Jack, who had faked his death using a cadaver and a duplicate car) meet at the carousel in Central Park, and use their tarot cards to turn it on. Dylan arrives and welcomes the four to the Eye. Later, at the Pont des Arts, Dylan meets with Alma and reveals that he is Shrike's son. He brought the Horsemen together to get retribution for his father's death: the Elkhorn Safe Company for providing a faulty safe that led to the accident; Thaddeus, for humiliating and impoverishing his father and forcing him to try the new trick to regain his standing; and the Crédit Républicain and Tressler's insurance companies for failing to pay out on Shrike's life insurance. Alma, who has come into a romantic relationship with Dylan, easily decides not to turn him in. She takes a lock and a key that Dylan produces, attaches the lock among the other love locks on the railing, and throws the key into the Seine. Jesse Eisenberg as J. Daniel "Danny" Atlas / The Lover: An arrogant illusionist and street magician, and the ostensible leader of the Four Horsemen. Woody Harrelson as Merritt McKinney / The Hermit: A hypnotist, mentalist, and a self-proclaimed psychic. Originally more famous in his youth, his manager brother absconded with all his money, leaving McKinney with a long hard trek back to his former glory. Middle-aged, McKinney is the oldest of the Four Horsemen. Isla Fisher as Henley Reeves / The High Priestess: An escapist and stage magician. She is also J. Daniel Atlas' former assistant and ex-lover. Dave Franco as Jack Wilder / Death: A sleight of hand illusionist, street magician, and a talented impressionist of other people's voices. Additionally, he is a pickpocket, and is able to pick locks. In his early twenties, Wilder is the youngest of the Four Horsemen. Mark Ruffalo as Dylan Rhodes-Shrike, an FBI agent struggling to capture and bring the Four Horsemen to justice for their unique heist agenda. In the end, he is revealed to be an illusionist, a member of the Eye himself, Lionel Shrike's son and the mastermind behind the entire heist mission. Mélanie Laurent as Alma Dray, a French Interpol agent who is partnered up with Dylan Rhodes to investigate the Four Horsemen. Morgan Freeman as Thaddeus Bradley, an ex-magician who, for thirty years, has profited by revealing the secrets behind other magicians' tricks. Michael Caine as Arthur Tressler, an insurance magnate and the Four Horsemen's sponsor. David Warshofsky as FBI Agent Cowan. Michael Kelly as Agent Fuller, an FBI agent who serves as Rhodes' sidekick. Common as Agent Evans, Rhodes's supervisor at the FBI. José Garcia as Étienne Forcier, the account holder at the Crédit Républicain de Paris. Caitriona Balfe as Jasmine Tressler, Arthur Tressler's young wife. Elias Koteas as Lionel Shrike, a magician who drowned while performing an escape trick thirty years earlier. Dylan is revealed to be his son at the end of the movie. 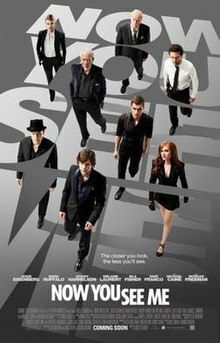 On October 25, 2011, Summit Entertainment announced the release date for Now You See Me for July 18, 2013. On November 3, 2011, the company revealed the film's first synopsis and teaser poster. On January 16, 2012, shooting began in New Orleans, Louisiana, which lasted until March 26, 2012. Additional filming took place in New York City on February 13 and in Las Vegas from April 9, 2012 to the following day. During filming of the scene where Henley Reeves tries to escape from a tank of water and piranhas, Isla Fisher came close to drowning. Fisher had become stuck and tried to alert the crew by banging on the window she was facing, but the cast and crew did not think anything of it because that was what the character was supposed to be doing. She was able to untangle the chain and get out of the tank safely. The official soundtrack, titled Now You See Me (Original Motion Picture Soundtrack), for the film was composed by Brian Tyler and was released by Glassnote Records on May 28, 2013 for physical purchase and digital download. The film's soundtrack song "Entertainment", performed by French rock band Phoenix, was featured in the film's end credits. All music composed by Brian Tyler, except where noted. The film premiered in New York City on May 21, 2013 before its official release in the United States on May 31, 2013 by Summit Entertainment. Now You See Me was released on DVD and Blu-ray on September 3, 2013 through Lionsgate Home Entertainment. The Blu-ray release contains an extended version of the film featuring ten additional minutes. It also contains two featurettes: a behind-the-scenes and a "History of Magic", plus 30 minutes of deleted scenes. By the end of its box office run, Now You See Me had grossed $117.7 million in the U.S. and Canada and $234 million in other territories for a worldwide total of $351.7 million, against a budget of $75 million. The film had a successful box office run, placing second behind Fast & Furious 6 and taking $29,350,389 on its opening weekend from 2,925 theaters. By the end of June, it had grossed double its production budget. The film stayed in the top 10 of the North American box office for six weeks after release. The biggest markets in other territories were France, China, Russia, South Korea, United Kingdom and Australia where the film grossed $25.7 million, $22.9 million, $21.2 million, $17.1 million, $16.8 million and $16.1 million, respectively. Now You See Me received mixed reviews from critics. The most common criticism is that various plot points were insufficiently resolved at the film's conclusion, leaving some questions unanswered or answered unclearly (although some suggested that this was intentional, leaving room for a sequel). On Rotten Tomatoes the film has an approval rating of 49%, based on 152 reviews, with an average rating of 5.7/10. The site's critical consensus reads, "Now You See Me's thinly sketched characters and scattered plot rely on sleight of hand from the director to distract audiences." Metacritic assigned the film a score of 50 out of 100, based on 35 critics, indicating "mixed or average reviews". Audience polls conducted by CinemaScore give the film a grade of "A–" on an A+ to F scale. Peter Hammond from Movieline wrote, "Pure summer movie magic—literally. More fun than Ocean's 11, 12, and 13 combined. You won't believe your eyes—and that's the point." On July 3, 2013, after the box office success of the film, Lionsgate's CEO Jon Feltheimer confirmed that there would be a sequel to the film with production beginning in 2014 for an unspecified release date. Louis Leterrier stated that he would return to direct the sequel; however, in September 2014, it was confirmed that Jon M. Chu would replace Leterrier as director. Eisenberg, Ruffalo, Harrelson, Franco, Caine and Freeman were set to reprise their roles for the sequel. Fisher was unable to participate because of her third pregnancy and was replaced by Lizzy Caplan. The film was released on June 10, 2016, titled Now You See Me: The Second Act. On October 2, 2014, Michael Caine said in an interview that Daniel Radcliffe would be playing his son in the film. Filming began in late November. On May 22, 2015, Lionsgate revealed the details about the development of the sequel, when CEO Jon Feltheimer announced that they had "already begun early planning for Now You See Me 3." ^ "NOW YOU SEE ME (12A)". British Board of Film Classification. May 28, 2013. Retrieved May 28, 2013. ^ a b c d "Now You See Me (2013)". Box Office Mojo. Retrieved November 3, 2016. ^ a b c d "Now You See Me (I) (2013) Full Cast & Crew". imdb.com. IMDb. Retrieved November 3, 2016. ^ Lussier, Germain (October 25, 2011). "'Ender's Game' Has A Release Date, So Does 'Red 2,' 'Now You See Me' And Others". Slashfilm. ^ Chitwood, Adam (November 3, 2011). "First Synopsis and Promo Poster for NOW YOU SEE ME Starring Jesse Eisenberg and Woody Harrelson". Collider. ^ "Be on the lookout for Tom Cruise, Leonardo DiCaprio, Chris Evans, Tom Hanks, Jesse Eisenberg & more celebs filming in Louisianadate=December 21, 2011". On Location Vacations. ^ "'Now You See Me' filming in NYC tomorrow". On Location Vacations. February 13, 2012. ^ "'Now You See Me', starring Jesse Eisenberg & Woody Harrelson, is filming in Las Vegas next week". On Location Vacations. April 6, 2012. ^ Graham, Caroline (May 11, 2013). "'"I feared that I was about to drown": Isla Fisher reveals moment daring underwater stunt went terrifyingly wrong". Dailymail.co.uk. Retrieved December 10, 2014. ^ "Various Artists - Now You See Me [Original Motion Picture Soundtrack]". Allmusic. allmusic.com. Retrieved November 10, 2015. ^ "Now You See Me Arrives on Blu-ray and DVD September 3". ComingSoon.net. CraveOnline. August 13, 2013. Retrieved August 13, 2013. ^ "The Judge – International Box Office". Box Office Mojo. Retrieved January 13, 2015. ^ "Review: 'Now You See Me' Starring Jesse Eisenberg, Woody Harrelson, Isla Fisher & Mark Ruffalo | The Playlist". Blogs.indiewire.com. Retrieved June 2, 2013. ^ "Now You See Me". Metacritic. Retrieved November 25, 2014. ^ Stewart, Andrew (June 2, 2013). "'Now You See Me' Pulls $28 Mil-Plus Rabbit, Beating 'After Earth' With $27 Mil". Variety. Retrieved June 22, 2014. ^ "Now You See Me - Movie Review". Youtube.com/user/MovielineNetwork. Retrieved May 30, 2013. ^ "Now You See Me (I) (2013) Awards". imdb.com. IMDb. Retrieved November 3, 2016. ^ Brew, Simon (August 13, 2013). "'Now You See Me' to get sequel". Den of Geek. Retrieved September 10, 2014. ^ Douglas, Edward (August 28, 2013). "'Exclusive: Louis Leterrier Back for Now You See Me Sequel". ComingSoon.net. Retrieved September 10, 2014. ^ "Lionsgate Sets Dates for Now You See Me 2 and Dirty Grandpa". ComingSoon.net. September 9, 2014. Retrieved September 10, 2014. ^ "Daniel Radcliffe to Play Michael Caine's Son in NOW YOU SEE ME 2". GeekTyrant.com. October 2, 2014. Retrieved October 2, 2014. ^ Mark Ruffalo. "And so it begins... Now You See Me...again". Mark Ruffalo Facebook. Retrieved November 25, 2014. ^ McNary, Dave (May 22, 2015). "'Now You See Me 3′ in the Works at Lionsgate". variety.com. Retrieved May 22, 2015. This page was last edited on 19 March 2019, at 22:27 (UTC).